For years, the debate over federal wildfire policy has been based on a simple premise: Thinning the forest makes out-of-control fire less likely. That's the question Chad Hanson, a California forest ecologist, says Congress is ignoring in its drive to harvest trees in the name of taming forest fires. A growing amount of research by Hanson and other scientists suggests forests with a lot of dead trees are at no more risk of catastrophic wildfire — and possibly less — than woods cleared of them. The reason: Live trees with oil-rich needles still attached burn faster than dead trees, Hanson said. And though other factors are only an educated guess, he said, researchers believe keeping loggers out of such woods may have a long-term benefit by letting dead trees fall to the forest floor, where they soak up water and slow the spread of fire. Hanson, who published a paper on the issue in 2009, said he realizes his hypothesis flies in the face of policy discussions in Congress, where Rep. Tom McClintock (R-Calif.) and other lawmakers pushing wildfire legislation are calling for more thinning of forests, including in areas of California struck by droughts and bark beetle infestations. Officials at the Department of Agriculture, which runs the Forest Service, share McClintock's view. "There's not even a hint that they're aware the science contradicts what they're saying," said Hanson, a research ecologist at the John Muir Project of the Earth Island Institute in Big Bear City, Calif. "They're in the business of fire suppression and logging." All sides agree that the fight against wildfire is consuming federal resources at a clip that can't be sustained. Wildfire suppression takes up more than half of the Forest Service's annual budget, forcing the agency to borrow money from other programs — including forest management — that could lead to healthier forests. Proposals in Congress to rein in costs rely on two approaches: ending the budget maneuvers and encouraging removal of potential wildfire fuel in the forest. As many as 102 million trees have died on drought-affected land in California since 2010, USDA has said. Hanson, whose paper with three other researchers was published in The Open Forest Science Journal, said foresters who link wildfires to beetle infestations that kill large numbers of trees base their findings largely on modeling and that his work was the first he knows of that tested whether high tree mortality leads to more severe fires. Another study followed in 2015, by Sarah Hart at the University of Colorado and others, and published in the Proceedings of the National Academy of Sciences. 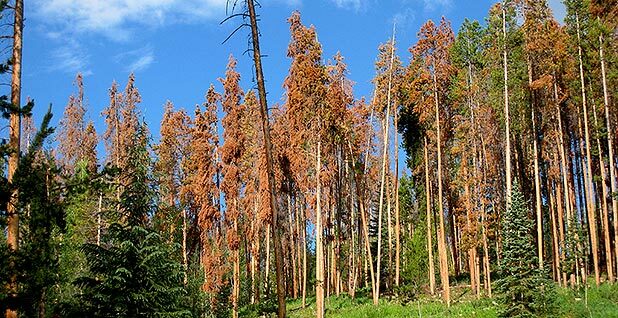 It found that areas in the western United States affected by pine beetles weren't any more affected by fire than non-infested areas. Further study in 2016 by researchers at the University of Vermont and Oregon State University found no increased risk of fire in Oregon and Washington state (Climatewire, April 28, 2016). Hanson's study focused on fires in the San Bernardino Mountains, a mixed-conifer forest. "Despite differences in sites and forest types, previous studies and our results provide compelling evidence that when fire does occur, stands with considerable tree mortality due to drought and insects will not burn at higher severity than stands without significant tree mortality, either in the short or long term," they wrote. Forests with the biggest trees saw less severe fires than forests with smaller trees, they said. "This result suggests that harvesting larger sized trees for fire-severity reduction purposes is likely to be ineffective, and possibly counter-productive," according to the study. Some foresters stick to the long-held view that fewer dead trees means less severe fires. "We have kept fires out, so this is the prevailing wisdom," said Thomas Horton, an associate professor of environmental and forest biology at the State University of New York College of Environmental Science and Forestry in Syracuse. While wet logs on the forest floor would slow fires, the bigger question is whether dead wood on standing trees will fuel faster fires, said Horton, who studied fire-affected woods as a graduate student and has taught a seminar on fire ecology. "Unless you can take it out, it's likely to get out of hand," Horton said. "That stuff is just going to light up." On the other hand, additional research has suggested that trees also shouldn't be removed from forests that have already burned, Horton said. Daniel Donato, a research associate at Oregon State in 2006, wrote a study suggesting post-fire logging hinders reseeding and increases the risk of more fire. That finding ran counter to other researchers' expectations and led senior scientists at Oregon State to ask Science magazine not to publish it (the study was already posted online, the magazine's editor, Donald Kennedy, wrote in an editorial at the time) and led the Bureau of Land Management to briefly consider withdrawing support for Donato's work. McClintock, the California congressman, introduced legislation earlier this year to ease environmental rules that delay forest-clearing projects. Timber companies should be able to go into infested and dying forests quickly, harvest what trees they can for lumber and grind up dead wood for use as chips, making forests safer and possibly boosting the ailing wood products business, he has said. McClintock has said his bill, the "Emergency Forest Restoration Act," or H.R. 865, could generate as much as $300 an acre in federal timber revenues, helping keep mills in business while reducing the fire risk (Greenwire, Feb. 20). Republicans aren't alone in pressing the case for removing dead trees. In California, Democratic Gov. Jerry Brown's emergency proclamation related to millions of dead trees blamed those conditions for the wider and faster spread of fires. But Hanson said that ignores research with a different conclusion. Forests allowed to keep their dead wood, called snag, are better for wildlife, too, Hanson said, and clearing them would have negative consequences that officials are overlooking. "If this is allowed, it would not only remove enormous amounts of carbon from our forests, and pump much of that carbon into the atmosphere through biomass burning, exacerbating human-caused climate change, but would also further threaten many native wildlife species that benefit from snag forest habitat and do not have enough habitat to maintain their populations," he said.